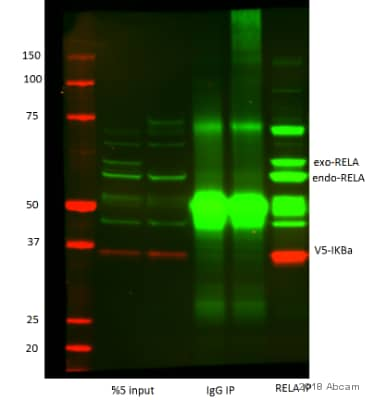 ELISA: Antibody specificity was verified by ELISA against the peptide conjugated to BSA (GKPIPNPLLGLDST-BSA). 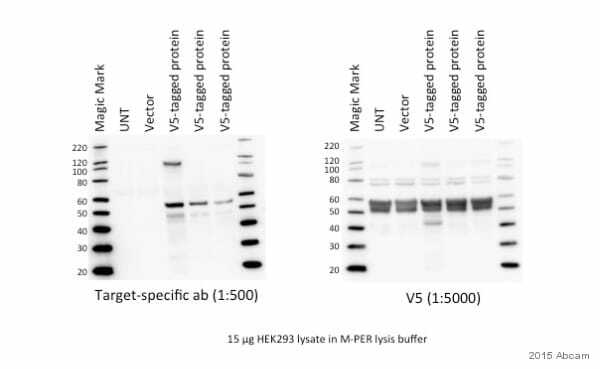 A 1:50,000 dilution of the antibody gave an O.D.=1.0 in a 15 minute reaction using HRP- conjugated goat anti rabbit (IgG) at 1:10000 and TMB as the substrate. Appropriate specificity controls were run. GKPIPNPLLGLDST (V5 epitope) conjugated with KLH. Antibodies were immunoaffinity purified using the peptide immobilized on a solid phase. Antibody concentration was determined by extinction coefficient : O.D. 1.4 at 280nM equals 1.0 mg .
Our Abpromise guarantee covers the use of ab9116 in the following tested applications. WB Use a concentration of 0.05 - 0.5 µg/ml. 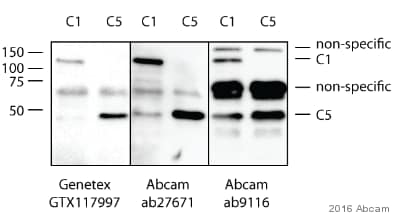 Can be blocked with V5 tag peptide (ab15829). IHC-P Use a concentration of 0.5 - 5 µg/ml. The V5 epitope tag is derived from a small epitope (Pk) present on the P and V proteins of the paramyxovirus of simian virus 5 (SV5). The V5 tag is usually used with all 14 amino acids (GKPIPNPLLGLDST), although it has also been used with a shorter 9 amino acid sequence (IPNPLLGLD). Lanes 1-3 : Cells transfected with v5-tagged protein. Lanes 4-5 : Untransfected cells. 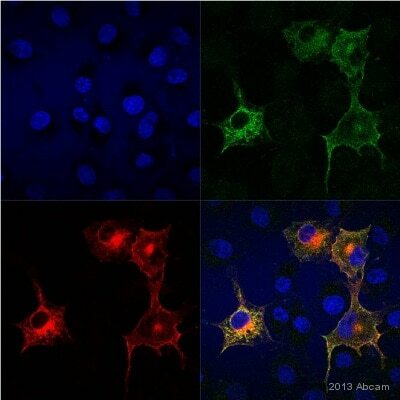 ab9116 staining V5 tag in the Human U2OS cells by ICC/IF (Immunocytochemistry/immunofluorescence). Cells were fixed with paraformaldehyde, permeabilized with 0.2% Triton X-100 and blocked with 3% serum for 1 hour at 4°C. Samples were incubated with primary antibody (1/300) for 1 hour at 4°C. 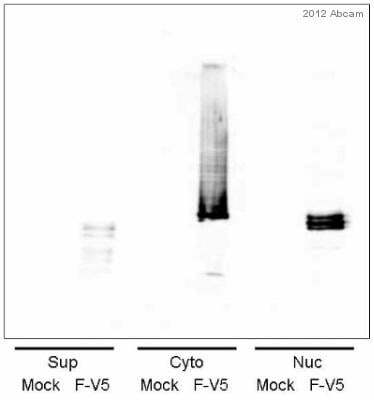 An Alexa Fluor® 488-conjugated Goat anti-rabbit polyclonal was used as the secondary antibody (1/300). ChIP qPCR: The graph on the left represents the input chromatin of PC3-EMT14-OVOL2 relative to empty vector (EV) control. The graph on the right depicts the ChIP DNA using V5 antibody (ab9116). The V5 epitope was included at the C-terminus of the expressed OVOL2. Results were normalized to input controls and graphs are relative to EV. Graphs show mean +/- sem. 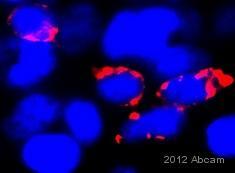 ab9116 at 1/1000 dilution staining V5 in V5-Pgc transfected Drosophila Kc cells by Immunocytochemistry/ Immunofluorescence. Kc cells were fixed in 4% formaldehyde for 10 minutes, washed in PBS-Tween 20 (0.05%) and blocked in 5% milk in PBS-Tween 20 for 1 hour. 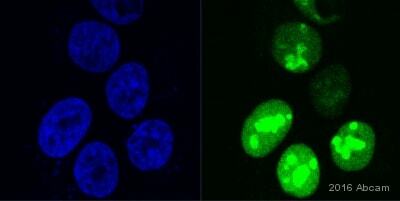 Cells were incubated with primary antibody at 4°C overnight and the secondary antibody at room temperature for 3 hours. Publishing research using ab9116? Please let us know so that we can cite the reference in this datasheet.